This page describes basics and types of ESD Ionizers. It mentions basic working principle of ESD control ionizer. As we know there are various reasons of electronic component failures, out of which 28% of failures are due to ESD (Electrostatic discharge). There are various mechanisms to control ESD related failures in the electronic components. 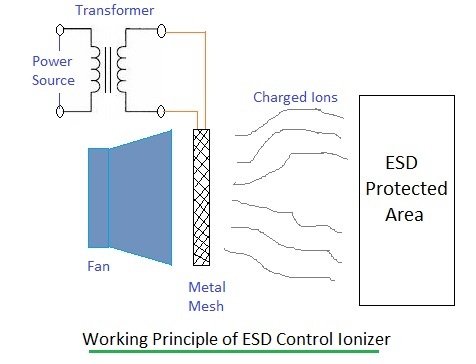 Ionizer is one such equipment used to control ESD related failures. They are considered to be effective in controling failures in class-0 components too. Ionizers are used to neutralise any undesired charge on ESD-sensitive components as well as on insulator present in ESD protected area. Ionizers in various forms are used as mentioned below. The figure depicts ionizer directed to area where charge is to be neutralised. Feedback sensors are used in feedback controlled ionizers. Let us understand working of ESD control ionizer. • As shown transformer is interfaced with AC power supply. For DC type of ionizers separate sources are used to generate positive and negative voltages. • Transformer does amplification of charges which are fed to metal mesh to get them charged. • A fan is used which pushes charged ions towards EPA (ESD Protected Area). Following factors are considered for selecting ESD control ionizer. ➨Class of ESD sensitive component to be handled. ➨Coverage area to be covered. This is required to choose desktop fan type ionizer or curtain type ceiling mount ionizer. ➨Should be modular so that easy maintenance can be done. ➨It should not affect nearby EM (Electromagnetic) radiating equipments.